Efe Ambrose has insisted Hibs boss Neil Lennon deserves his new contract given the success he has already brought to the club. Lennon ended the Capital outfit’s three-year exile from the top flight of Scottish football by winning the Championship title in his first season – and Nigerian internationalist Ambrose believes he’s far from finished. Ambrose, who played under Lennon at Celtic and was persuaded to sign a two-year deal with Hibs as one of the club’s eight summer signings after enjoying a loan spell in Edinburgh, claimed the former Northern Ireland internationalist continued to demand the same high standards as he did in Glasgow. He said: “I think it’s a good thing for the manager to stay. What he has put into the club in the last year has been great, the ambition – he knows the game, his mentality and everything. “I think he deserves a new contract for getting the team back to where it belongs and trying to push the team to where they’re supposed to be, among the great teams in Scotland. Ambrose agreed Lennon’s name alone can help lure players to Easter Road with striker Anthony Stokes persuaded by the Hibs head coach to sign up for a third spell at the club. And, he revealed, as long as he and his team-mates can keep a smile on Lennon’s face then they’ll know they are doing fine. While pointing out Hibs don’t enjoy the same budget as Celtic – set to pick up £30 million more from their latest Champions League exploits – Ambrose said: “It’s different, but with his mentality I think he can get the best out of the players to compete at the highest level. “That’s one thing I know about him and working with him, the most important thing is the winning mentality. He has a lot of experience in the game, has played at the highest level and that alone helps in motivating us to play the way we’ve been playing. “Stokesy and I know him from Celtic. He doesn’t take any slackness from players, he doesn’t like losing, which we know all about. “You know that if you’ve lost or haven’t played well in a game you’re going to have to face him and you know what that means. “The players want to do the best to really get him smiling, because you don’t want to see the other side of him. We try to do our best on the pitch, make sure we do our talking on the pitch so when we get back to the dressing-room he is smiling. Lennon certainly wasn’t doing so following last weekend’s shock defeat by Hamilton Accies but, insisted Ambrose, those issues have been addressed ahead of tomorrow’s Premiership match against pointless Dundee at Dens Park. 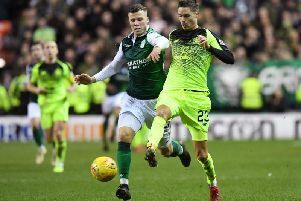 Tomorrow will bring Ambrose face-to-face with a figure familiar to both him and the Hibs support, Scott Allan, the midfielder trying once again to kick-start his career in Dundee in a season-long loan deal from Celtic.